Hotel Sheep Guest House is the first and only place in the world meant exclusively for sheep. No other animal is allowed inside. Not even rams. And you would be surprised to know that at Hotel Sheep, the sheep aren’t housed in regular barns, but in luxury rooms such as Five star hotel rooms!!. Each of Hotel Sheep Guest House rooms consists of fine beds and television sets, in case they get lonely. Other services include a full-time trained maid service, and complete clean up. This unique Hotel Sheep Guest House was Located in Yugawara, Kanagawa Prefecture, the Hotel Sheep Guest House is mainly aimed at fashion-conscious young rich people from the world of business, who have realized sheep are the pets of the moment. And since dog and cat hotels have been very popular in the Western world, the Japanese though they should open a similar venue for sheep. 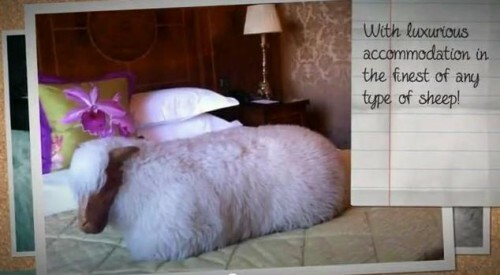 So if you have a cute cuddly, gentle and loving sheep's you can leave them at this Hotel Sheep Guest House in Japan. Watch the video below.